Our 315 auction will take place March 9-10, 2018. There are 1747 lots of all kinds and sizes. This particular sale includes many large collections and accumulations. 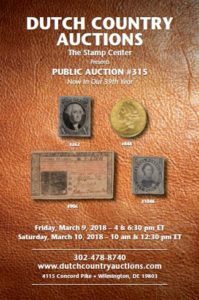 There are many strong cover lots with advertising, event, air, Naval, CSA, Collins cachets, Weddle and many large FDC lots. Postcards are well represented again with many large topical, state and novelty themes. In the worldwide cover section there are many large valuable lots. U.S. singles feature a nice #1 unused followed by many attractive singles like #188 unused, 209b with APS cert, 240 NH block with PF Cert, 432 PSE 98, 480 PSE 98 and much more. There are many strong accumulations and collections that deserve a look. In our currency section we have a wonderful group of Colonials and Notgeld. Our worldwide section is loaded with singles, country collections, topicals, accumulations and large lots. We hope you find something you need!